So often, parents of young children put off designing their space or purchasing nice pieces until the children are grown. With modern technology and a few tricks, you’ll see why creating a stylish, kid-friendly environment isn’t as hard as you think. Having a young family is a joy, especially if you have created beautiful and unique environments to enhance those special moments together. With a little planning and following these simple ideas, you can create your space to endure family life for years. Furniture that has a more natural, rustic or antique feeling is a great choice for young families because nicks and scratches are less noticeable on a piece that already has a weathered look. Selecting light colored woods is a great option too because they hide dings better than dark-stained woods. 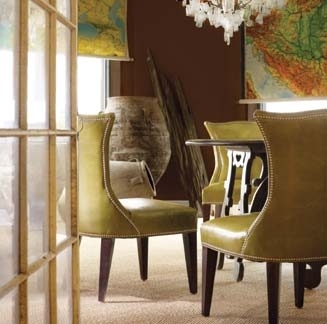 In selecting sofas and chairs, opt for easy-care leathers, microfiber, or even vinyl. Although leather is a more expensive option, it can endure a beating from children and pets and washes off easily. You may also consider an outdoor fabric such as Sunbrella or even slipcovers that are washable. Either way, try a pattern as they hide dirt more easily than solids. Avoid skirts on upholstery as they are a dirt and hair magnet. Keep furniture with hard edges away while children are young. Go for more natural or organic coffee tables or consider softer ottomans. When necessary to have hard edges, but sure the corners are more rounded to avoid injury. Of course you’ll also want sturdy quality furniture to withstand abuse and for safety. Furniture should have dual purposes and accommodate your families’ storage needs. Choose a variety of sizes of storage from large storage trunks to small drawers to keep up with the ever-changing cycle of kid’s toys. Lastly, keep your furniture flexible. Activities change so often with young ones; let your furniture be more adaptable and movable to accommodate various activities. Hardwoods or laminates are family friendly and great for higher-traffic areas in your home. Laminate isn’t always ideal from a design perspective, but the options are getting better and areworth the design sacrifice for the function while you raise your family. Spills are easily cleaned on these hard surfaces. You’ll know what we mean if you’ve ever tried to clean red punch stains off a carpet. Rugs can be used for added softness and cleaned more easily than wall to wall carpet. Non-skid pads are important to keep the rug from slipping underneath tiny feet. In the home’s private areas where carpet is more appropriate, you’ll want a pattern or texture to hide the dirt. Going with carpet tiles is also an alternative. If you do have a stain, you can simply replace the one tile and the stain is gone. Paints that withstand kid’s sticky fingers are also improving. Be sure to select a paint that is washable for busy households. Typically, the higher the gloss the more washable the paint. Eggshell finishes are becoming more and more washable and are a more comfortable sheen. In some areas of your home, you may even want to consider washable wallpapers for added protection from fingerprints. If you have an area that needs extra durability, go for more durable finish work such as bead board or even consider a dramatic treatment such as upholstered vinyl walls. The added upfront cost, will save you from costly repairs and cleaning later. Safety should be your first consideration for window treatments if you have tiny ones around the house. Many window treatments now are offered cordless as well for a safety feature. Simply remember that long draperies, as much as we love them, might not be perfect for playful children. The long panels are a temptation to play with (and a perfect hide-and-seek spot) and may fall if not secured properly. Gases from paints, carpet, and finishes can be toxic to a young child. As much as possible, choose low VOC (products that don’t release significant pollutants), organic or natural products for the health of your home and family. Eventually your children will grow up (a sad thought, we know) and you can get those luxurious fabrics and furnishings you’ve been waiting for. For now, remember that just because you have young ones doesn’t mean your family doesn’t deserve a well-designed and organized space. Your children will thank you. All furniture shown is Lee Industries available through Atmosphere ID.